Revolucion De Cuba is one of those places I used to be obsessed with, to the point where I discovered that you really can have too much of a good thing. Consequently, I had to take a bit of a break from the Mappin Street venue formerly known as Buddha Bar/Bai Hoi. But after stuffing my face with a tonne of tacos courtesy of Revolucion De Cuba’s all-you-can-eat Taco Tuesday, I’ve rediscovered why I liked Revolucion De Cuba so much in the first place. So I was really excited to attend the launch of their new menu, together with some other Sheffield bloggers and newsy types. 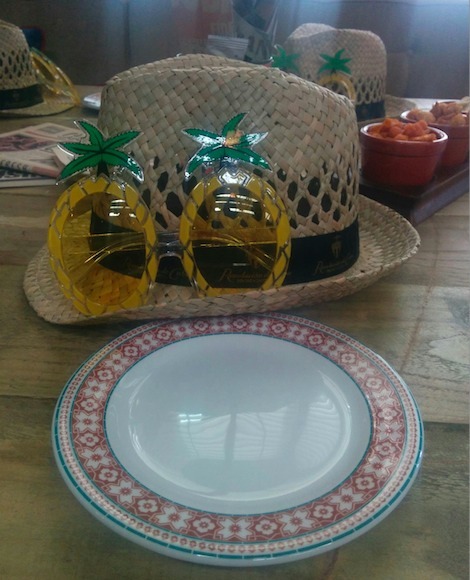 Right off the bat, I’ve got to say that Revolucion De Cuba know how to make a special occasion fun, as we arrived to find our table decked out with funky pineapple glasses and straw hats. Cheesy it may be, but I love this kind of stuff. Glasses donned and selfies snapped, it was time to kick things off with a cocktail from Revolucion De Cuba’s ginormous drinks menu. Even though I had every intention of branching out and trying something new, after reading the menu from front to back I still couldn’t resist ordering the exact same thing I always go for. I just love the tartness of this Pornstar Rumtini, as it’s fruity without being too sweet, plus it comes with a shot of sparkling wine on the side, which can only be a good thing. Since we’re smack bang in the middle of a heatwave, my dining companion opted for a frozen Banana Daiquiri (£7.25). This cocktail comes with a chocolate flake, and the daiquiri itself is so thick and icy that it can support said flake without any issues. This banana daiquiri is pretty much a dream for anyone with a sweet tooth, and it’d make the perfect, refreshing pudding after you’ve finished stuffing yourself with spicy Cuban grub. As we sipped our cocktails, we were treated to a trio of moreish nibbles: banana chips (£1.50), pork crackling, (£1.50) and spicy mixed nuts (£1.50). 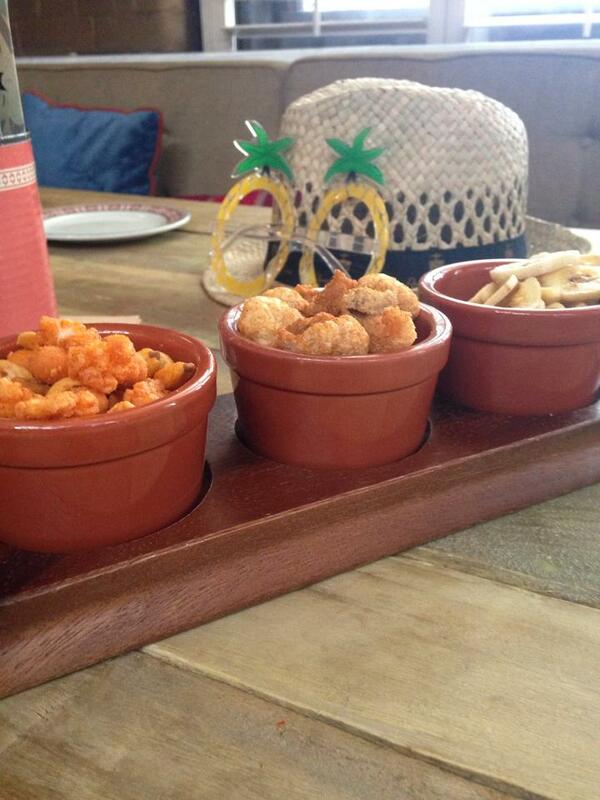 These nibbles are great if you fancy something to crunch on while you peruse the main menu, particularly the pork crackling which is something a bit different from your bog-standard bar snacks. Onto the hot food, and Revolucion De Cuba brought out lots of tapas, sides and mains for the whole table to share, so brace yourselves because we have lots to cover. 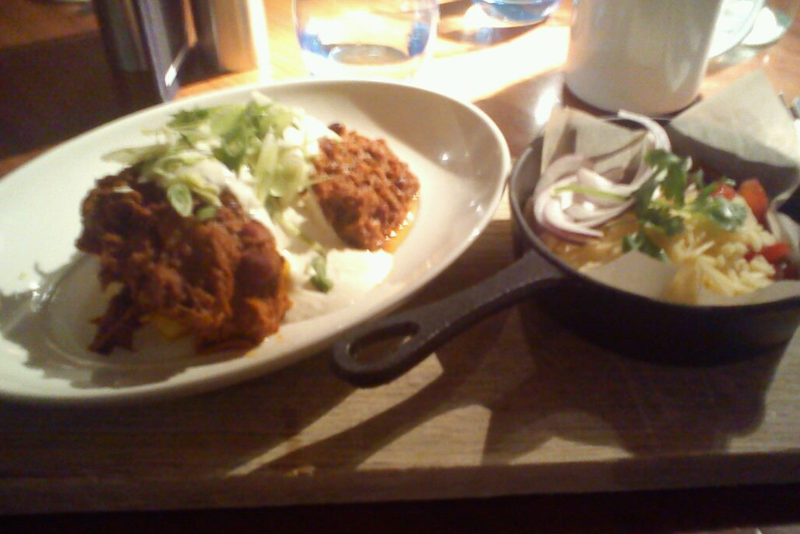 First up was a plate of Smoky Aubergine Quesadillas (£5.00). These quesadillas were packed with lots of yummy melted cheese, and came with a very fresh and homemade-looking tomato and onion salsa. For £5.00 this is a filling tapas dish that I can imagine eating on its own as a snack or even as a starter when I’m feeling particularly hungry. For the meat eaters, there was a main course of Havana Chicken Salad (£9.50). 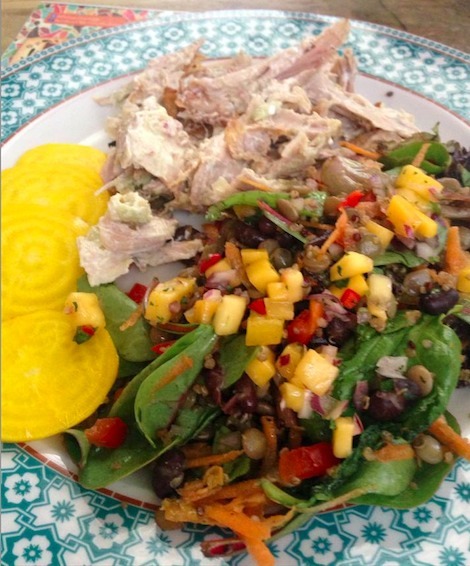 The chicken was tender, juicy and nicely-seasoned but what really caught my eye was the colourful side salad. This vibrant salad consisted of quinoa, green lentils, peppers, carrots, tomato, cucumber, black beans, edamame beans, yellow beetroot and leaves, finished off with a homemade spinach and kale dressing. I don’t think I’ve ever seen a salad that looks quite this good! Sometimes I feel like restaurants use side salads just to fill up the plate. Not so with Revolucion De Cuba! They’ve clearly gone all out to create a side salad you’ll actually be excited to eat. This side salad appears in several other main courses and you can even order a ‘Cuban Salad’ on its own, which might just be one of the few occasions I’d actually consider ordering a salad in a restaurant. This Cuban salad made a repeat appearance at our table, as part of a Baked Halloumi (£11) main course. 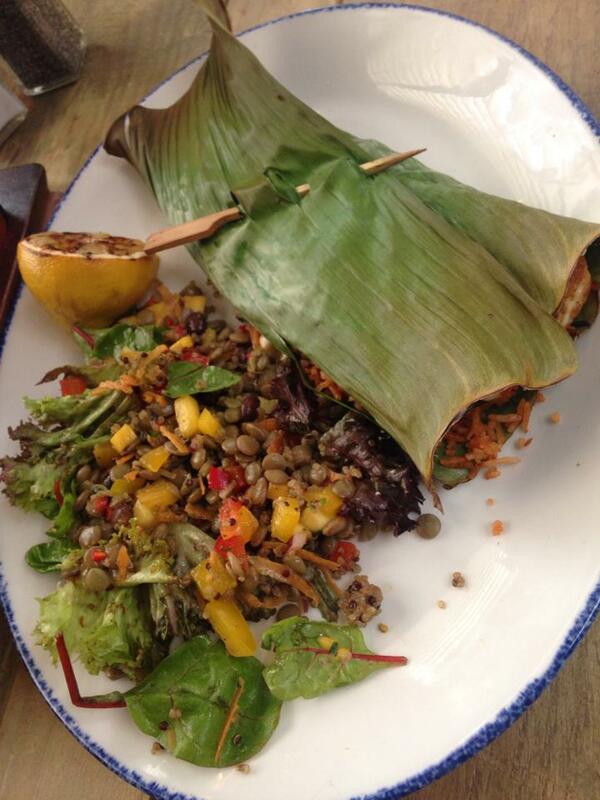 This main is essentially a super-sized portion of halloumi, marinated in soy and ginger, and then served in a banana leaf with a helping of that awesome Cuban salad. I’m mad about halloumi anyway, so I was always going to enjoy a main that’s mostly just a massive piece of halloumi, but the soy and ginger marinade gave this particular piece of halloumi a powerful, salty and very distinctive taste. This is easily the best halloumi I’ve ever had. If you’ve got a soft spot for halloumi or you just love strong, salty flavours, then you need to try Revolucion De Cuba’s baked halloumi. You won’t be disappointed! Next up was everyone’s favourite Tex-Mex snack: nachos. 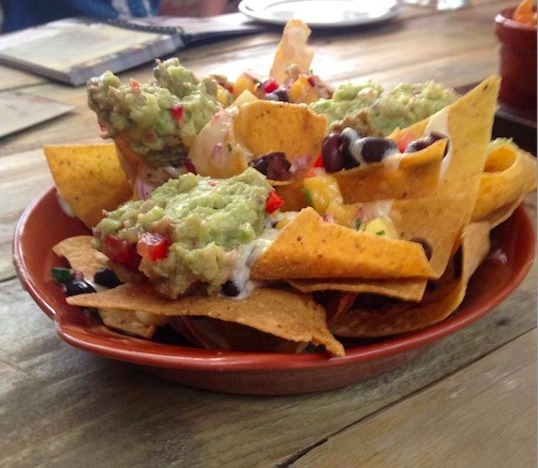 These Nachos Del Sol (£5.50) take crunchy tortilla chips and cover them in black beans, guacamole, homemade Roquito and Manchego cheese sauce, and chunks of mango. I can’t remember ever having fruit on nachos before, but the mango added a welcome sweetness to this otherwise very savoury snack. I might just have to try sprinkling some mango on top of my own nachos in the future. The nachos were followed by yet more tapas, in the form of some Iberico Ham Croquettes (£5.50). 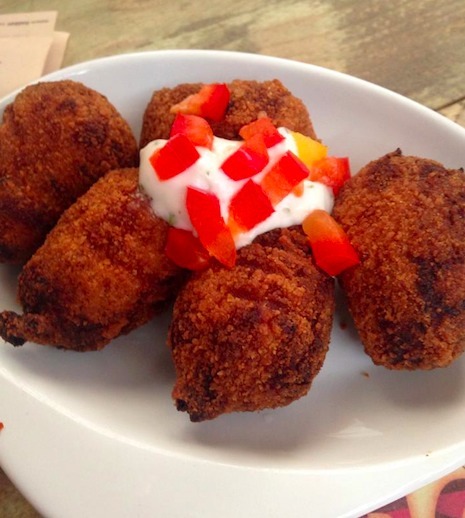 Apparently Iberico is a special kind of Spanish ham that’s salted and air dried for 12 months (thanks, Google) which explains why these croquettes had such a strong, salty flavour. The Iberico croquettes are particularly nice with a dollop of the accompanying garlic aioli dip. I was already feeling pretty stuffed, but it turned out there was even more food for us to sample. An entire platter of it, in fact. This was roughly the point where I started to wish I’d been more restrained around that baked halloumi. The first plate on our platter was sticky glazed Chorizo in a rich red wine and honey sauce (£6.00). This is hearty, comforting tapas with a slight kick to it, and I can imagine this really hitting the spot during the colder months. Also on our super-sized platter was a side of sweet potato fries (£3.00). Like the halloumi, sweet potato fries are something I love anyway, so I knew I was going to enjoy these – but they were even better than I was expecting! These sweet potato fries were perfectly cooked: crispy and nicely-salted on the outside, but fluffy and sweet on the inside. They also went really well with Revolucion De Cuba’s homemade rum sauce, which has a nice kick to it, not to mention the kind of freshness you simply can’t get from a supermarket-bought bottle. The final side on our mega-platter was House Rice (£2.50). This is something I loved the last time I visited Revolucion De Cuba and it was every bit as good as I remembered, particularly the topping of finely-chopped, crispy fried onions, which were incredibly moreish. At £2.50 this is another fantastic side dish. Revolucion De Cuba are really getting their sides spot on at the moment. But the main event was an enormous Half Chicken in Mojo Sauce (£11, with two side dishes). This is a massive portion of nicely-cooked chicken, but if you’re seriously hungry then apparently you can go one step further and order an entire chicken! This was when the lovely Revolucion De Cuba staff broke the news that there was even more food to come. In fact, we hadn’t even had our main course yet (!) as everyone would be getting the chance to prepare their own burrito. But what’s the perfect thing to do before trying your hand at a new culinary skill? Okay so this isn’t as heinous as it looks. 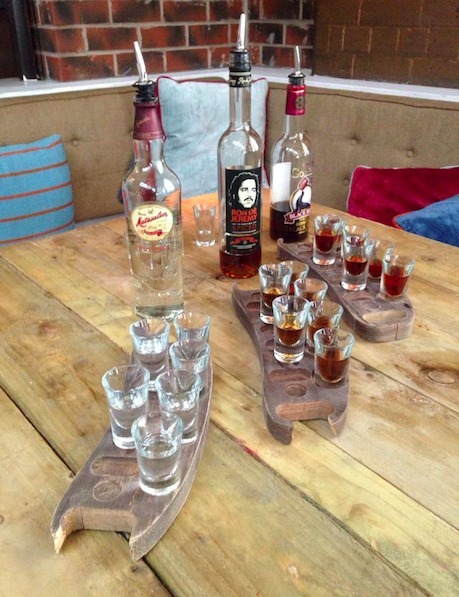 This was actually a quick rum tasting session where we got to sample three different rums from Revolucion De Cuba’s extensive collection. Despite the fact that I’m not a massive fan of drinking anything neat, this turned out to be lots of fun. This is the second rum tasting I’ve attended, and both times I’ve been pleasantly surprised by the range of rum that’s out there, from the painful-to-drink, to the dangerously easy drinking. Speaking of painful, the first rum (Matusalem Platino) was so harsh that finishing a single measure felt like a major accomplishment. Thankfully it was all uphill from here as the second rum (Ron de Jeremy) was smoother, and the third rum (Gosling’s Black Seal) had a faintly butterscotch aftertaste that I enjoyed so much, I could actually see myself drinking this again! If you’re interested in checking out what rums Revolucion De Cuba have to offer, you’ll find a complete list at the end of their drinks menu. 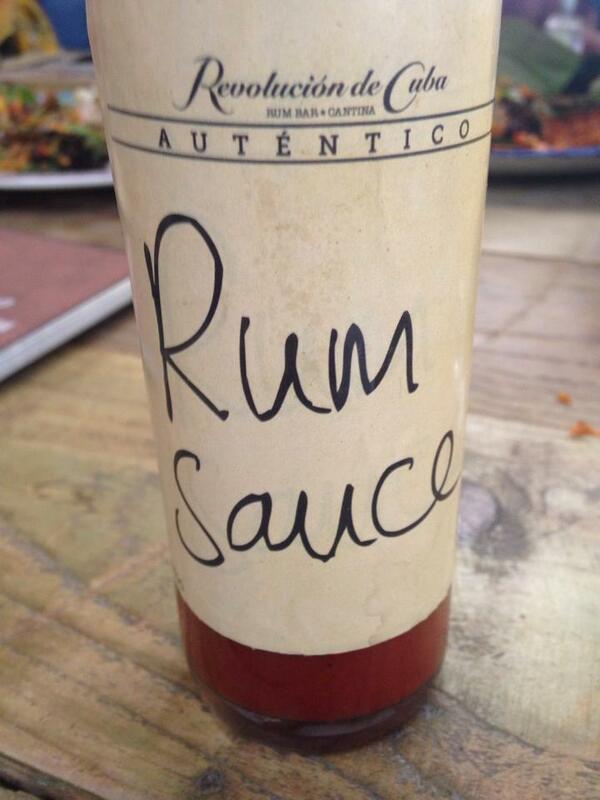 Okay, so three measures of rum dispatched and obviously the time was right to try and roll the perfect burrito. This went predictably…..wrong, but at least all the ingredients that went into my sloppily-rolled burrito were good! 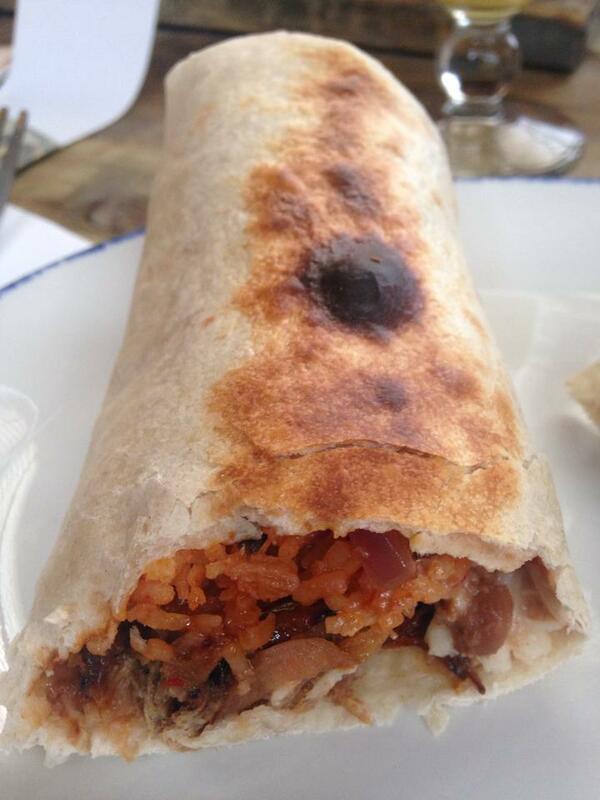 In the end, my burrito consisted of refried beans, garlic mushrooms, fried veggies and spring onions, plus generous helpings of sour cream, grated cheese and house rice, so it wasn’t a million miles away from Revolucion De Cuba’s own Mushroom, Bean and Spinach Burrito (£9). When it came to wrapping my concoction, I discovered that it’s much harder to roll the perfect burrito than you might think, which is why I’m not going to show you a photo of my handiwork. Instead, here’s a photo of my dining companion’s chicken burrito, for the simple reason that they did a much better job than me. And thus concluded our Revolucion De Cuba feast. I left feeling like I’d eaten Revolucion De Cuba’s entire menu, but after consulting their website I realise that I’d barely even scratched the surface. Revolucion De Cuba’s mammoth menu features tapas, sides, burritos, half and full chickens cooked in a variety of spices, hamburgers, a “fast and fresh” Rapido Lunch menu, a Fiesta Cubana three-course set menu, all-you-can-eat Taco Tuesday, plus a tonne of other main courses that don’t fit neatly into any of the above categories. With so much choice, you might think that this is a case of quantity over quality, but everything I sampled from Revolucion De Cuba’s new menu was delicious, and there wasn’t anything I wouldn’t order again. Revolucion De Cuba serve great food and great cocktails, in a lovely venue with some amazing special offers – if you love a bargain then you’ve got to visit them on a Sunday, when it’s 2-4-1 on all tapas and the majority of cocktails. 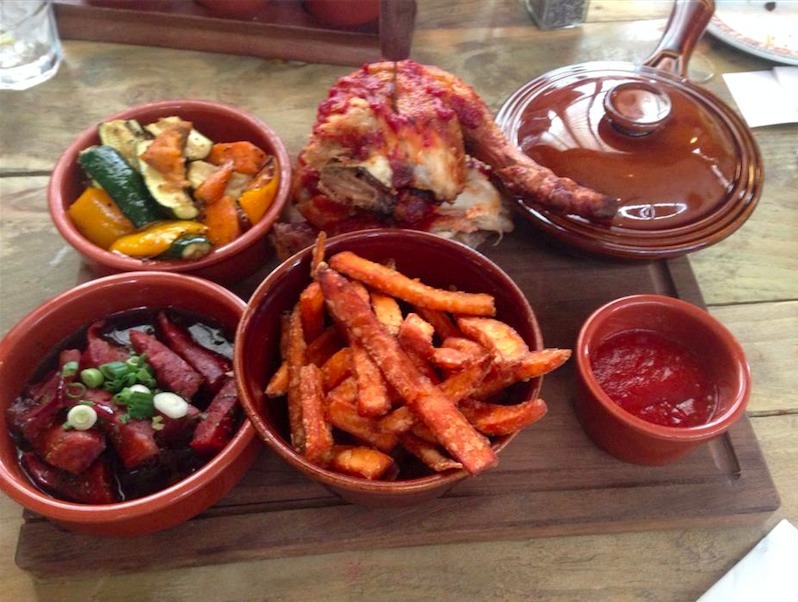 I can’t think of anything negative to say about this place, so if you have a soft spot for this kind of Cuban-inspired food, or you just love great cocktails, then you should make a point of paying Revolucion De Cuba a visit! 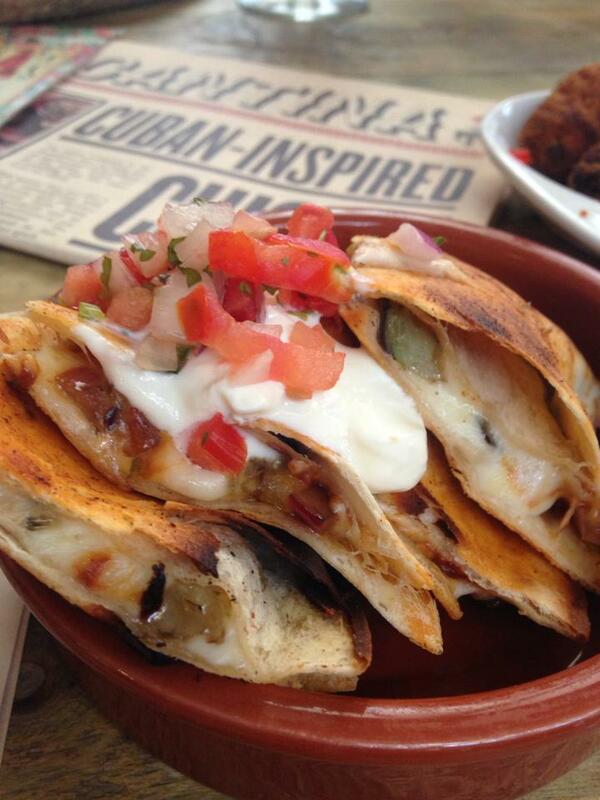 When I first moved to Sheffield, I got a bit obsessed with Revolucion De Cuba’s Sunday offers. 2 for 1 on cocktails and tapas all day, every Sunday? What better way to stave off those back-to-work-in-the-morning blues! So apart from the odd cocktail I hadn’t spent that much time in Revolucion De Cuba lately. This meant I was completely unaware of their ‘Taco Tuesday’ deal, where you get to eat as many tacos as you want for £10. So when the nice folk at Revolucion De Cuba got in touch and asked if I’d like to come along and eat tacos, I was looking forward to my first Taco Tuesday experience. When me and a friend arrived early on Tuesday evening, there was already a few large parties happily tucking into rounds of cocktails and tacos, and a live band in full swing. The band were fun and certainly added to the party atmosphere, but the music was so loud that me and my friend spent most of the evening shouting at one another across the table. 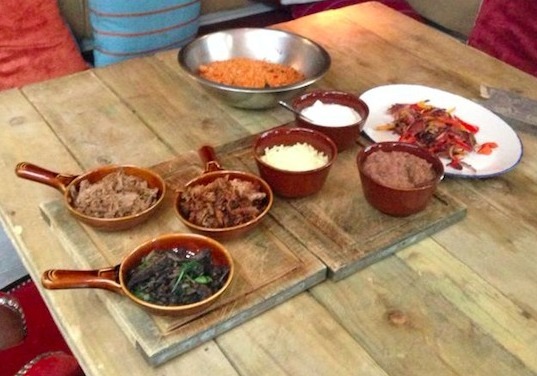 If you’re after a chat and a chilled out Tuesday evening, then Taco Tuesday isn’t for you. The idea behind Taco Tuesday is that you can order as many platters of chicken, pork or vegetarian tacos as you want, so I went for the veggie option while my partner in crime opted for the pork. 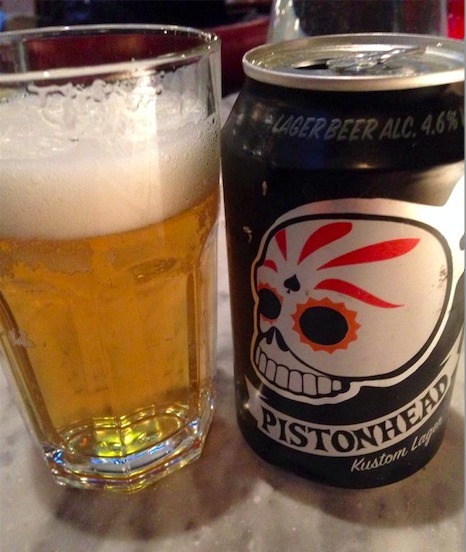 The deal also includes a soft drink or a can of Pistonhead lager. No prizes for guessing that I went with the boozy option! As well as the usual beers, wines and spirits, Revolucion De Cuba has a massive cocktail menu full of quirky and unique concoctions. If you’re a cocktail fan, then it’s worth making a trip to Revolucion De Cuba for the drinks menu alone. As soon as I polished off my Pistonhead, I got stuck into the cocktail menu and ordered a Pornstar Rumtini (£7.95). While I’m not a fan of the name, I loved the tangy, fruity taste of this cocktail – not to mention the shot of prosecco that’s served on the side. 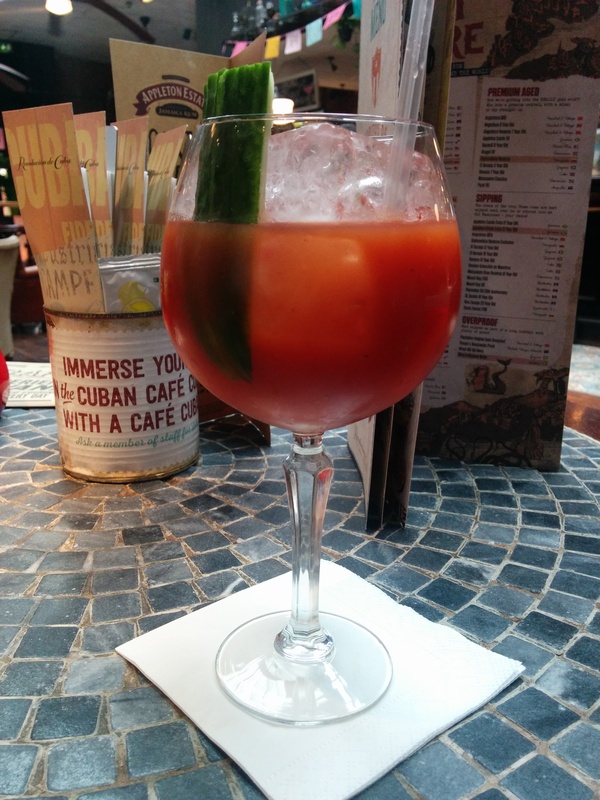 My friend opted for Revolucion De Cuba’s take on the Bloody Mary – the Bloody Pirate (£6.95). This cocktail has just the right amount of spice, and the tomato juice is really light and refreshing. This is one of those drinks that feels as though it’s doing you good, rather than just getting you tipsy. If you’re into the whole hair of the dog thing, this would be an amazing hangover-buster. 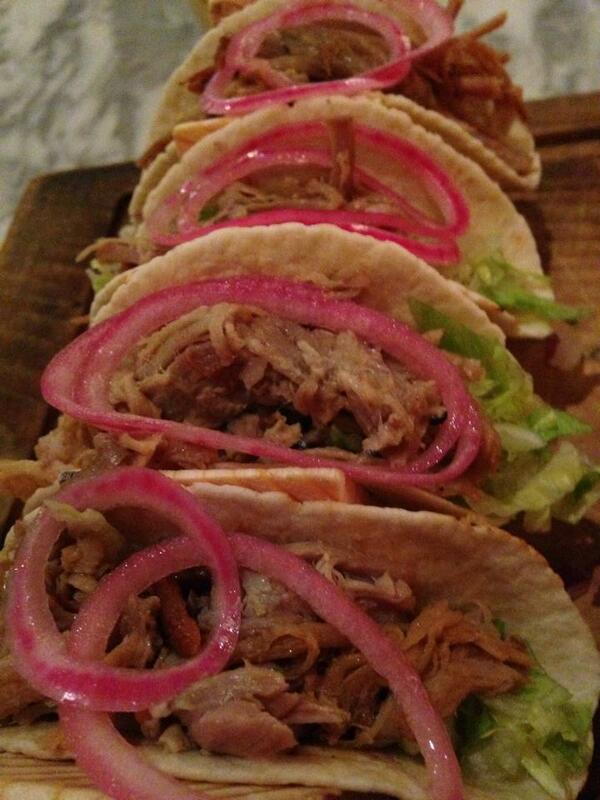 Our first round of tacos arrived pretty sharpish. Both sets of tacos came with a surprise side of rice, which I hadn’t spotted on the Taco Tuesday menu. The rice is rich and delicious, but it’s also really filling so I had to stop myself from eating too much of it. If you want to get your money’s worth, then go easy on the stodgy rice – at least until you’ve polished off a few rounds of tacos! Speaking of tacos, the main part of my vegetarian taco filling was seasoned mushrooms, instead of a veggie mince or bean chilli filling. Also making an appearance in my soft-shell tacos, was a diced tomato and onion relish, and tangy red onions that had an unexpected, almost pickled taste. I hadn’t been expecting this burst of sourness, but it gave my tacos a delicious added bite. The pork tacos didn’t have this problem; these tacos was generously filled with pork, and topped with those unique, sour onions. 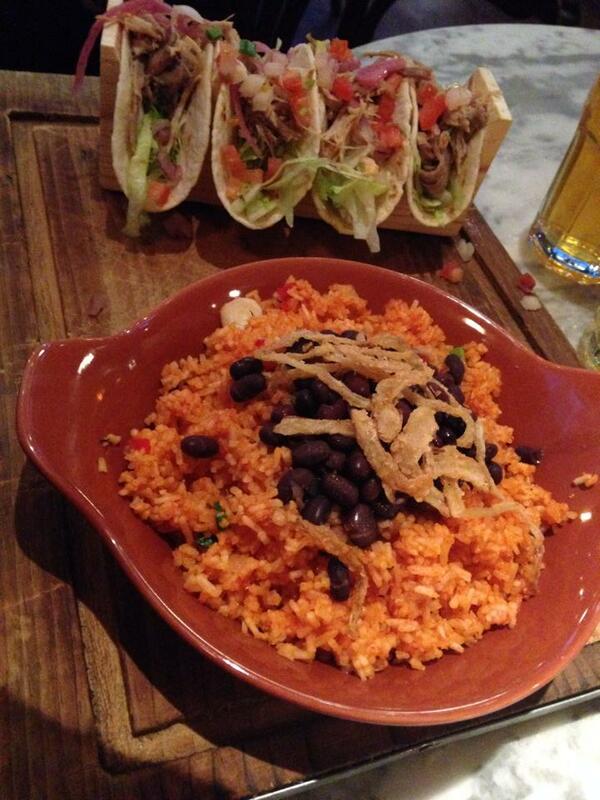 Since Taco Tuesday is all you can eat, it would have been rude not to have a second helping! The filling in our second round of tacos was much warmer, and we also got a much bigger helping of onions. Both me and my friend agreed this second round of tacos was nicer than the first. When anything is “all you can eat,” you’re always going to get a different kind of food than your typical restaurant fare, but to say this was all-you-can-eat-for-£10 with a drink thrown in too, I was really impressed with the quality of the food. Inbetween stuffing my face with tacos, I had a look at Revolucion De Cuba’s main menu, and they’ve definitely given their food a revamp since the last time I visited. The menu now promises treats such as sea bass cured with lime and chilli, blue cheese burgers, and sweet potato and feta enchiladas – all of which sound amazing. 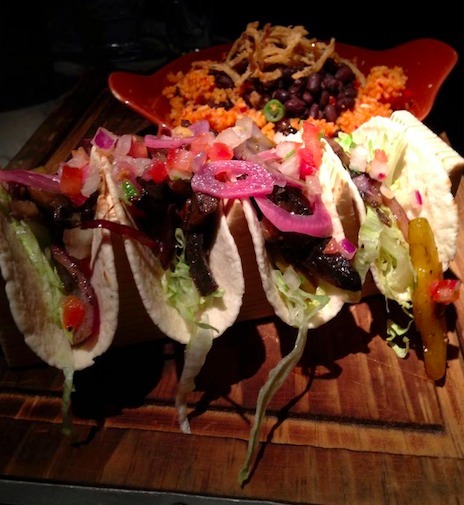 If you’re in the mood for a fun and filling night out that won’t break the bank, then Taco Tuesday is value for money, and the quality of the food is good considering you can eat as much as you want. With a great cocktail menu and a tempting main menu, I know it won’t be long before I pay Revolucion De Cuba a repeat visit for some non-all-you-can-eat food action. 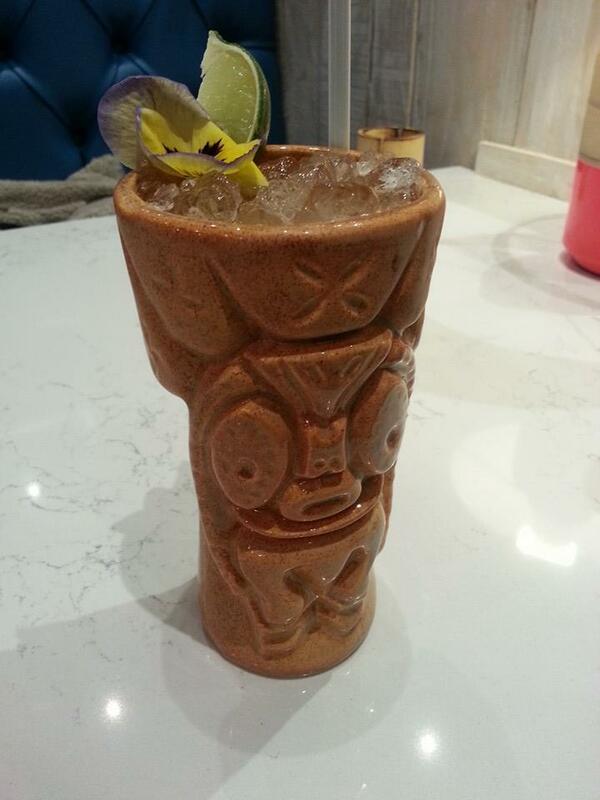 If there’s one thing I love more than a cocktail bar, it’s a themed cocktail bar, so I was excited to receive an invite to the launch of a new ‘Sunday Rum Club Session,’ at Sheffield’s very first Tiki bar, Bamboo Door. Bamboo Door is located in the swanky Leopold Square, inbetween Wagamama’s and the building that used to be Platillo’s. It’s a relatively small venue, but it’s surprising what Bamboo Door have managed to do with the space, without making it feel in the least bit cluttered or claustrophobic. The Tiki decor that might have felt naff or gimmicky, is actually really fun. This is a classy Tiki bar, rather than a cheesy one. The bar in particular is fantastic; it looks like it’s been transported from some distant beach, complete with shaggy straw roof. It’s worth visiting Bamboo Door, just to experience the decor – and maybe to fantasise that you’re ordering cocktails at a beach bar in some exotic location! 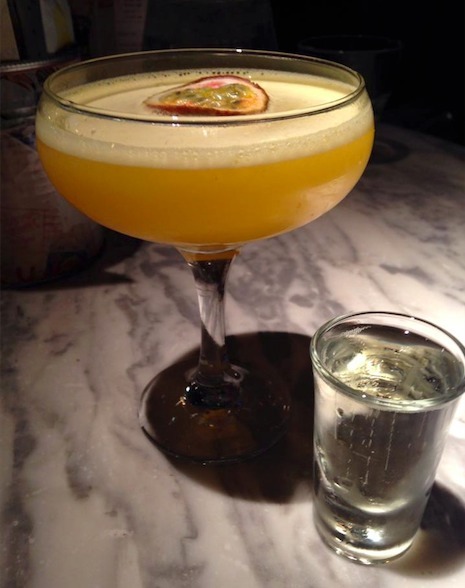 I’ve visited Bamboo Door on a couple of occasions and, although this post is supposed to be about their new Sunday Rum Club Session, I can’t resist talking about how great their cocktails are first. Bamboo Door’s cocktail menu has all the Tiki-themed classics you’d expect, including the Mai Tai, Daquiri, and Zombie, but the majority of the cocktails seem to be Bamboo Door’s own creations, which is always nice to see. 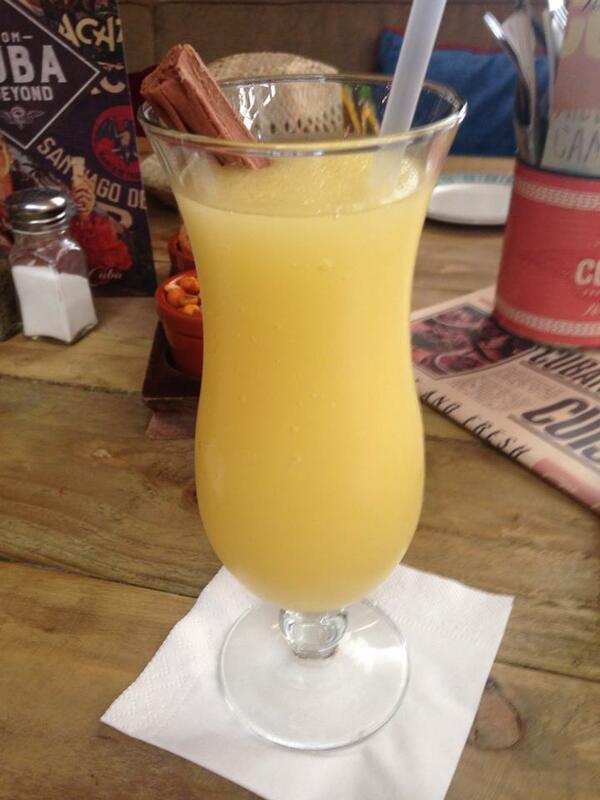 You certainly can’t order a ‘Bananas in Bahamas,’ or ‘Mangoes in a Bar’ anywhere else in Sheffield! Bamboo Door’s cocktails are characterised by lots of tropical fruit juices, and some of the most over the top garnishes I’ve ever seen. Their ‘Eat, Shoots and Leaves’ cocktail is a particular favourite, as it’s topped with a marshmallow, which the barman blow-torches behind the bar, so it arrives warm and gooey in the middle – delicious! Other garnishes include cubes of crystallised ginger; pineapple leaves; and an entire grocery store’s worth of assorted tropical fruits. 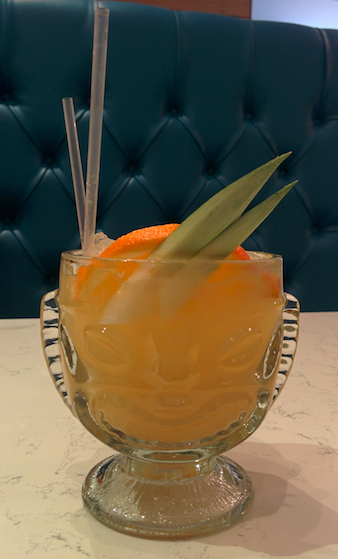 Spend an afternoon in Bamboo Door, and you’re guaranteed to get your 5 a day from garnishes alone. Despite the extravagant toppings, Bamboo Door are also reasonable about the amount of booze they put in your drink – sometimes, innovative and quirky cocktails that utilise a long list of fresh ingredients, have a tendency to skimp on the booze, so I’m happy to report that a few cocktails at Bamboo Door will leave your head pleasantly fuzzy. The prices of Bamboo Door’s cocktails are reasonable, particularly for somewhere like Leopold Square, and you can expect to pay between £6-£7 for most cocktails on the menu. But, the thing I love most about Bamboo Door, are the glasses. Bamboo Door have the coolest collection of cocktail glasses I’ve ever seen. 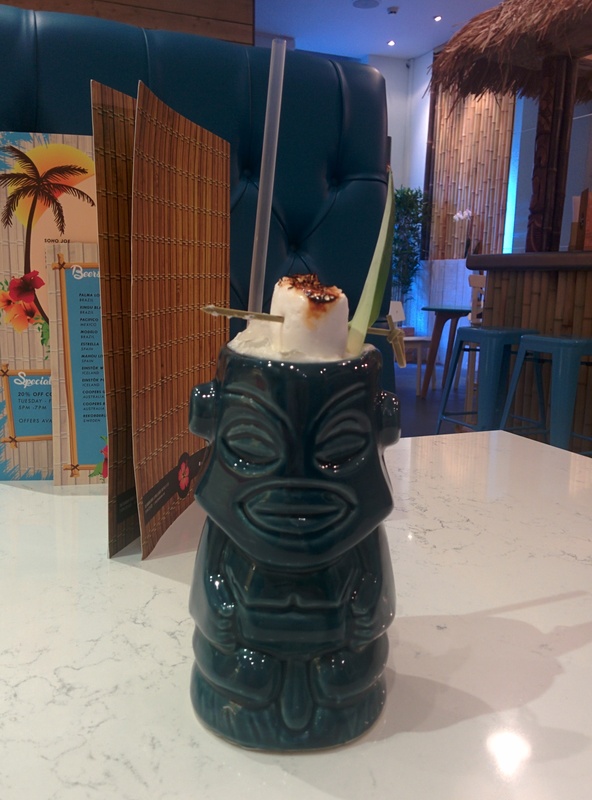 Drinking a coconut cocktail out of a tall green glass shaped like a grinning totem, topped with a freshly-toasted marshmallow, isn’t an experience you can get anywhere else in Sheffield! But, onto the main purpose of this blog – Bamboo Door’s new, once-monthly ‘Sunday Rum Session,’ where participants can learn more about the wonderful world of rum. During each session, everyone gets to sample two different kinds of rum, plus at least two cocktails, with optional soft drinks, too. Each session costs £25, or you can become a member of Bamboo Door’s ‘Rum Club,’ and pay £15. Since Rum Club membership is £10, it makes sense to become a member of Rum Club if you’re planning to attend at least one Sunday Rum Session, especially since membership entitles you to other discounts, too. On the night of this particular rum session, we arrived at Bamboo Door early, so we decided to start the session right then and there, and ordered a round of drinks. When I noticed Bamboo Door had a special Jalapeno Margarita cocktail on offer that night, I couldn’t resist – I had to give this spicy-sounding concoction a go! The Jalapeno Margarita arrived in a glass that was encrusted in chilli flakes. Even for a lover of spicy food like myself, this looked a little scary! The drink lived up to expectations, as the chilli-coated glass burnt my mouth, while the hot margarita mix caught in the back of my throat and, embarrassingly, made me cough. This is easily one of the hottest drinks I’ve ever tasted. As I took cautious sips of my stinging Jalapeno Margarita, my rum session buddy examined the long list of imported beers sold at Bamboo Door. 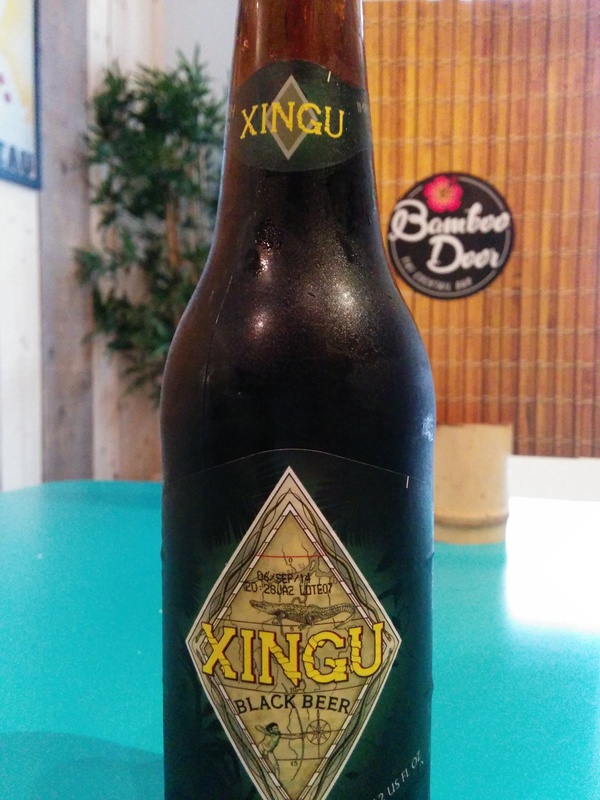 In the end, he opted for a bottle of Xingu Black (£4.20), which he thoroughly enjoyed. After a short wait, we were informed that rum club was about to start, and it was time to take our seats. We were introduced to Tom, who works at Bamboo Door and would be leading our rum session this evening. He kicked things off with a brief history of rum, and an overview of all the different kinds of rum that are available today. Tom was extremely enthusiastic and knowledgeable about rum, and was more than happy to answer our questions. He was even willing to fetch some of the other rums from behind the bar, despite the fact that none of them had anything to do with this particular rum session. 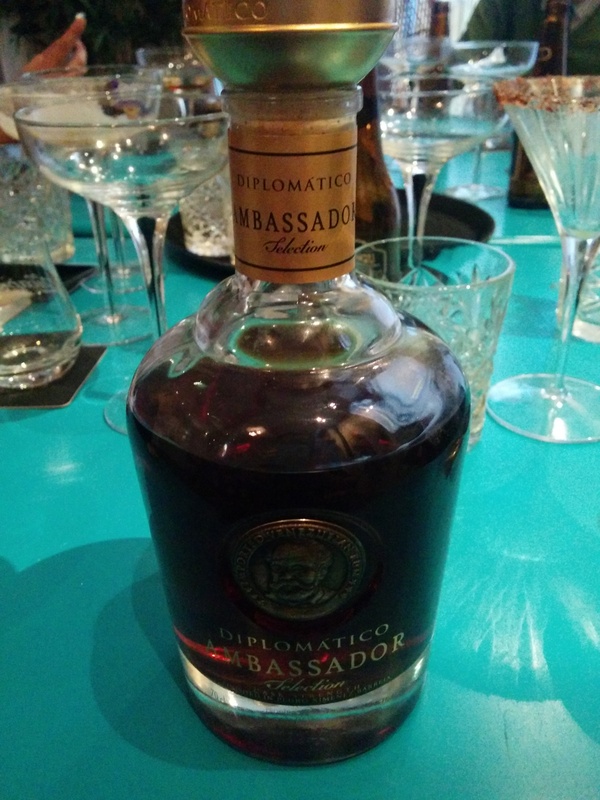 This is how we got our hands on the most expensive bottle on Bamboo Door’s menu, the Diplomático Ambassador, which retails at almost £200 per bottle! Unfortunately, we did have to give it back. Throughout his introduction, Tom kept stressing that the whole point of these rum sessions, is to show people that there’s much more to rum, than a glass of Bacardi and coke. I’ll admit that I’m a staunch “spirit-and-a-mixer” person, but even I found myself caught up in Tom’s enthusiasm, and was suddenly excited to get my hands on the first of this session’s rums. As already mentioned, each rum session focuses on a particular brand of rum, and the rum Tom had selected for tonight’s session was Ron Zacapa. Our first taste of Ron Zacapa, was a generous measure of Zacapa 23, which we sipped while Tom went into great detail about the run’s complicated ageing process, which was fascinating to hear. Despite not being a fan of drinking anything neat, I found the Zacapa 23 smooth enough to enjoy on its own and, although it had a long, slow after burn, it actually wasn’t in the least bit unpleasant. 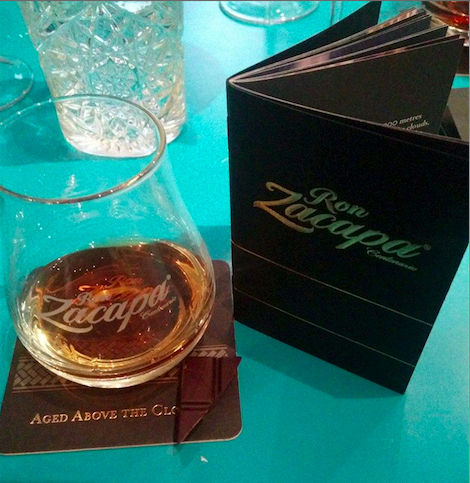 The Zacapa 23 had a complex flavour, with hints of vanilla, cocoa, and brown sugar, with an underlying woodiness. After we’d sipped the rum on its own, we were each given a square of dark chocolate. Tom told us to take a bite of the chocolate and chew, then sip the rum and swill the two together. The effect was incredible: the chocolate completely took the burn out of the rum, and exaggerated its previously subtle cocoa notes, so the Zacapa 23 suddenly tasted like the strongest, most luxurious chocolate liqueur imaginable. I wasted no time polishing off the rest of the rum and chocolate, all the while daydreaming about dark, cold winter nights spent at home with a bottle of Zacapa 23 and a big bar of dark chocolate. Maybe I’ll treat myself when the nights start drawing in! The second rum of the evening, was Zacapa XO. Tom explained that this rum starts life in exactly the same way as the Zacapa 23, before it’s put into cognac casks for a further two years. This is a pricier rum, with a bottle retailing at around £100, so understandably the measure was a bit smaller this time around. The Zacapa XO was a darker rum, with a deeper flavour to match – it had a smoky, almost tobacco quality to it, with a hint of brown sugar that reminded me of the Zacapa 23. It also had less of an afterburn than the first rum, which was definitely a good thing in my opinion. Overall, the Sunday Rum Session at Bamboo Door was a fun, informal, and interesting experience. Even if the thought of learning how different rums are made doesn’t fill you with enthusiasm, trust me, Bamboo Door’s staff know how to make distilling seem fascinating! After an hour or so of listening to Tom and sipping Ron Zacapa, I had a totally newfound appreciation for rum. The evening is also good value for money, as you get a good few measures of quality rum, a couple of cocktails, plus the entertainment of one of Bamboo Door’s knowledgeable bar staff taking you on a journey through everything there is to know about rum. 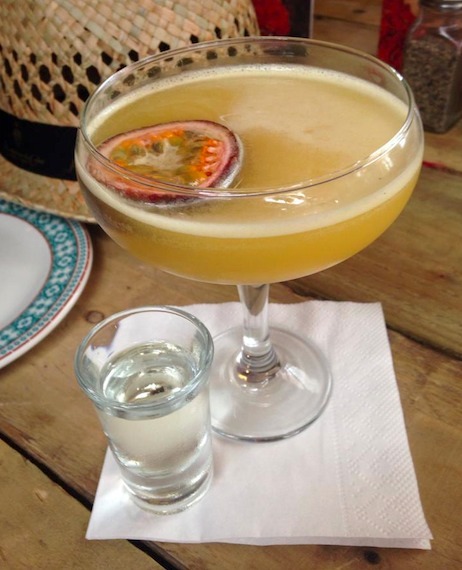 There’s nothing else like Bamboo Door in Sheffield at the moment – it’s a fun, quirky, independent cocktail and rum bar, with friendly staff and a very welcoming, relaxed vibe. 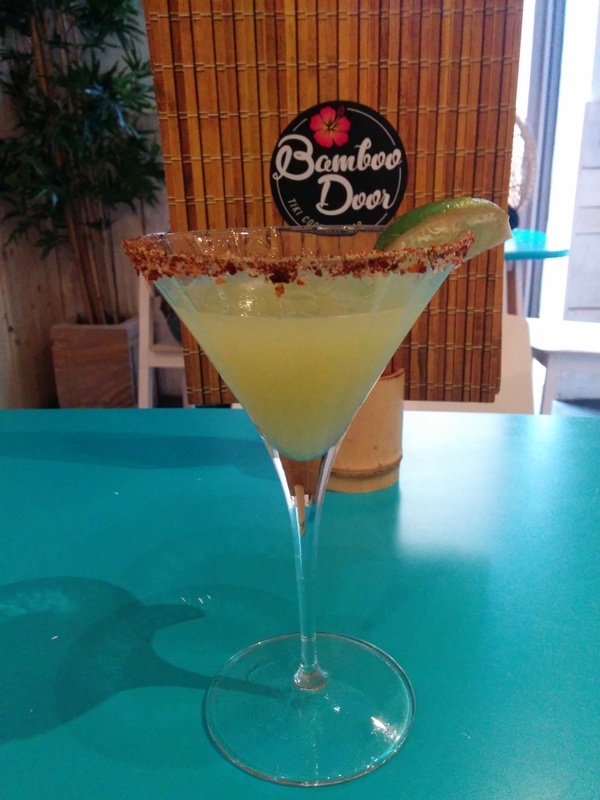 Bamboo Door is a great addition to the Sheffield bar scene, whether you’re attending a rum session, or just enjoying a cocktail. If you haven’t given Bamboo Door a go, then you’re missing out! I was a regular fixture in Rise’s beer garden in my uni days, perfecting the art of making a glass of house white last all afternoon, so I was surprised to discover that Bloo 88 wasn’t next door to Rise as I’d previously assumed, but had actually replaced my old haunt on West Street. But is it a change for the better? Cocktail connoisseurs will find all the old favourites at Bloo 88: Mojitos, Cosmos, Mai Tais and Martinis, but there are a few unusual options too, including a Vanilla Laika (named after the first dog in space, apparently!) and a Brazil-inspired Passion Fruit Batida. The cocktails are fairly priced, with quite a few coming in at a reasonable £4.95, with the added promise of two cocktails for £7 if you visit during happy hour. 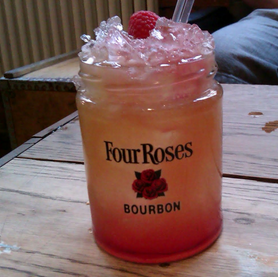 Not to be outdone, the Godfather Sour was served in a funky little jar, topped with a whole raspberry and plenty of crushed ice. It tasted every bit as good as it looked. Expectations high after our lavish, alcohol appetizers, we turned our attention to the food menu. Bloo 88’s speciality is pizza, which doesn’t sound particularly exciting at first, but rest assured even their ‘classic’ pizzas feature unusual toppings like baked egg and pine nuts. If you’re feeling adventurous, Bloo 88 have some speciality pizzas too, including the intriguing ‘Shanghai Surprise’ topped with shredded duck, spring onions and hoisin sauce, or you can throw caution to the wind and build your own pizza from an impressive list of ingredients. Starved, greed got the better of us and we opted for two twelve inch pizzas – the Mediterranean (£8.95) and Brunch (£8.95.) Our food arrived quickly and, to our delight, we saw that Bloo 88’s presentation skills aren’t restricted to cocktails. Instead of arranging thinly-sliced toppings evenly across the base, Bloo 88 scatter thick, chunky toppings, and then seem to cook them wherever they fall. This gives the pizzas a very homemade, rustic appearance. Biting into my first slice, I discovered a generous wedge of melt-in-the-mouth, warm goat’s cheese – a perfect pizza, from the very first bite. As well as goat’s cheese, the Mediterranean toppings included cherry tomatoes which had that delicious, lightly-grilled tang, spinach, roasted garlic and slabs of portobello mushroom. 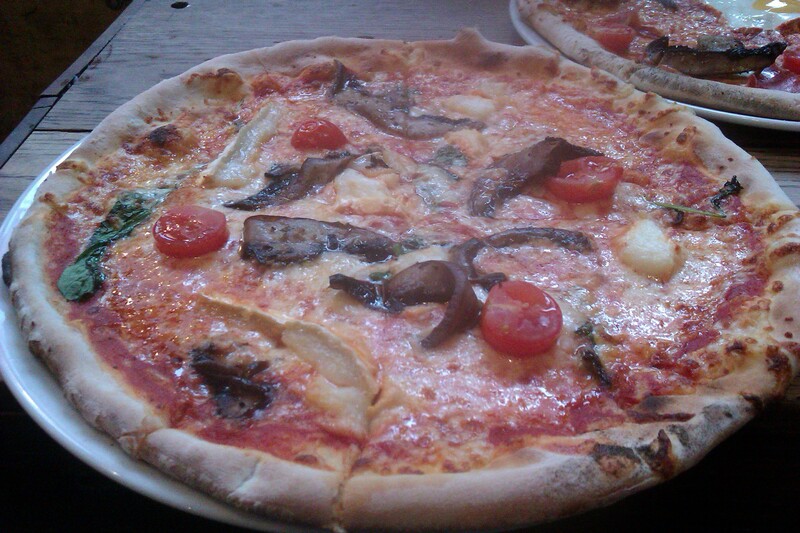 I’d wolfed down half of this scrumptious pizza before it even occurred to me to try adding some sauces. It turned out Bloo 88 did have plenty of sauces to compliment their pizzas, but they were tucked away on a trolley in the corner, along with the cutlery and napkins. The staff hadn’t asked whether we wanted any sauces with our meals (or cutlery and napkins, either) and hadn’t even told us about the trolley. After the bar staff pointed me in the right direction, I returned to the table armed with sauces and cutlery, but this should have been pointed out to us earlier. After experimenting with a few sauces, I can definitely recommend a few splashes of the Tabasco for hot-heads like myself. Bloo 88’s thin base and fiery Tabasco is a match made in heaven. The rest of the pizza disappeared in no time. 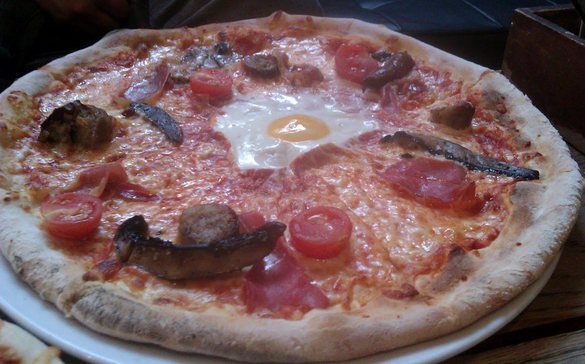 But it wasn’t all about the veggie pizza; the intriguing-sounding ‘Brunch’ pizza turned out to be a bumper meat-feast of parma ham and italian sausage, with the same perfectly-cooked cherry tomatoes and mushroom wedges, but with a baked egg in the centre giving this pizza a real ‘wow’ factor. Although our reviewer initially complained about the lack of runny yolk, once they’d chowed down on a calorific forkful of baked egg, cheese and pizza base, they quickly changed their mind and started raving about the egg instead. The parma ham had the crispiness and crunch of bacon (and who doesn’t love that?) and the italian sausage delivered a hit of salty flavour. Another massive thumbs up for Bloo 88’s grub. Stuffed from twelve inches of pizza goodness, we asked for the bill only to discover that classic pizzas are 2 for 1 all day, every day – what more could you want? It’s difficult to pick fault with Bloo 88 – the surroundings are welcoming and rustic, the cocktails are delicious and presented with flair, and the pizzas are cheap, delicious and guaranteed to leave you scanning the menu, plotting what you’ll order on your next visit (Florentina and New Yorker pizzas, in case you’re interested.) The staff could be a bit more attentive and check whether you’ll be needing anything else with your meal but really, fetching your own Tabasco is a small price to pay when the pizza is this good. If you love pizza or cocktails, then Bloo 88 is your new favourite haunt. The loss of Rise wasn’t such a big deal after all. 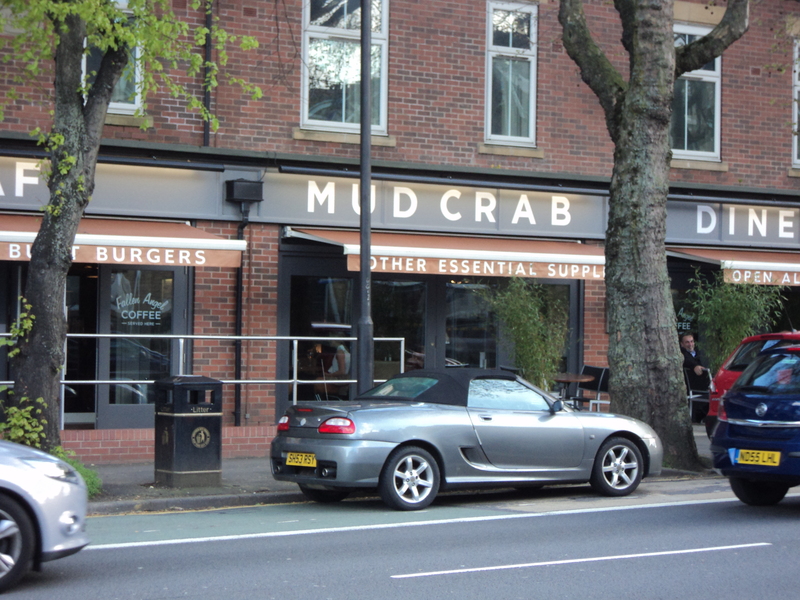 When news first reached Sheffield Eats HQ that Felicini was closing and opening in its place was newcomer Mud Crab, we were all shocked. 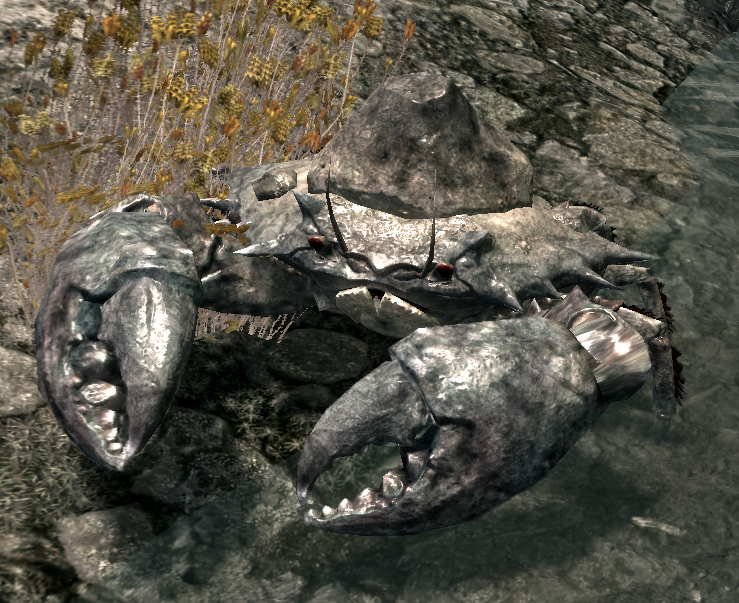 Felicini always seemed to draw a healthy crowd, and besides, aren’t Mud Crabs those pesky little blighters who mob you everytime you go anywhere near water in Skyrim?? So, not sure what to expect, we made a trip to Mud Crab over the opening weekend, in search of nourishment and a few cheeky pre-dinner cocktails. Firstly, Felicini fans will be happy to learn that the interior is still recognizably Felicini, just with more pictures of motorbikes and some vaguely nautical flourishes, such as exposed iron rivets that look like they’ve come straight from the Titanic. The staff are very friendly – one of the waiters had seen our party wandering around Ecclesall Road earlier and joked that he was convinced we were stalking him, and the bar staff were eager to chat while mixing up our cocktails. To kick off our Mud Crab initiation, our thirsty party ordered a platter of cocktails. The Chocolate and Banana cheesecake cocktail (£6.50) is an absolute must for those with a sweet tooth, tasting like a creamier version of a Bailey’s. 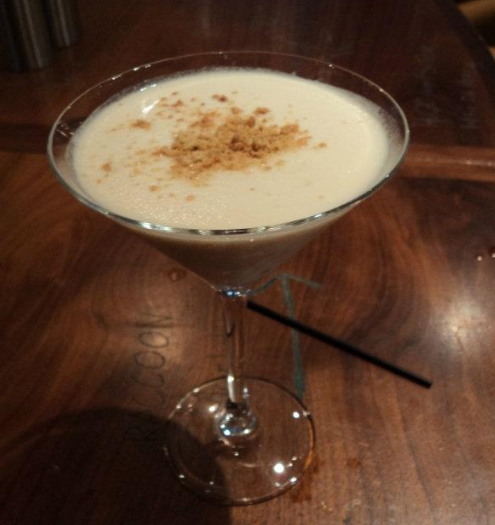 Just be sure to tackle this one on an empty stomach; it’s like pudding in a glass! 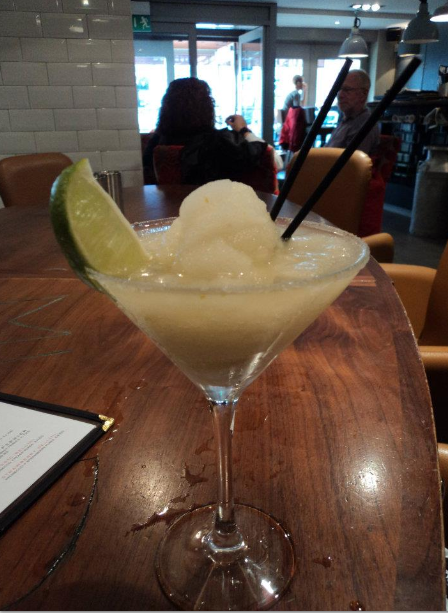 We also ordered a Jalapeno Margarita (£6.50) – cocktail connoisseurs that we are, we still have to admit that this is a new one on us. A refreshing mix of ice, tangy lime and jalapenos, this is aimed at those with an adventurous palate, and it split opinions at the table. We also sampled some daiquiris (£6.50), which come in a range of flavours. 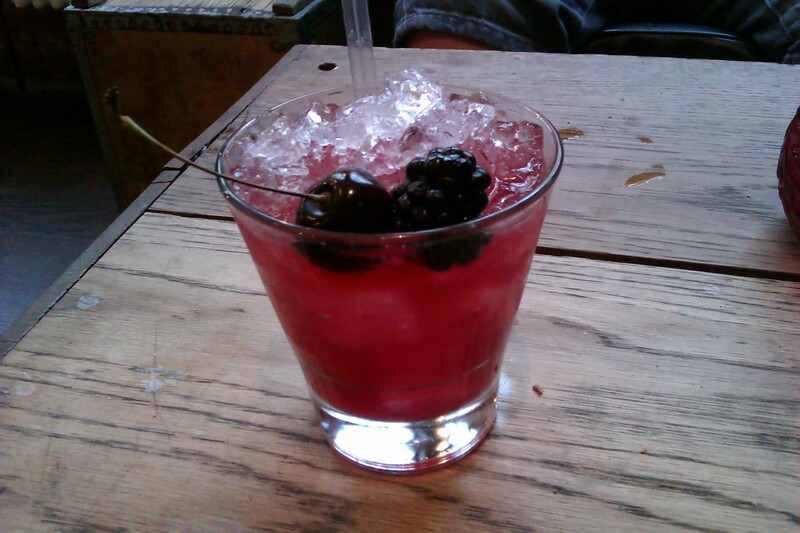 We opted for a creamy banana daiquiri and the blackberry version, which seems to be made from real blackberries and not syrup, judging by the blackberry seeds. The cocktail menu isn’t particularly extensive, but it contains many you’d be hard pressed to find anywhere else in Sheffield, which makes the Mud Crab a must for cocktail fans. But enough about the cocktails – onto the food! Mud Crab specialises in “custom built burgers and other essentials.” Customers can choose from a mouth-watering list of toppings for their burger: double mature cheese, chopped jalapenos, fried egg, cream cheese… Here, we hit a snag: there’s no veggie burger on the menu, and I don’t eat meat. Neglecting to include a veggie option is a major oversight. The burgers coming out of the kitchen looked amazing, so hopefully this is something they’ll sort out soon. Unfortunately, this lack of veggie options isn’t restricted to the DIY burgers: if you’re a vegetarian, the only thing you’ll be able to eat on the menu is a posh cheese and tomato pizza. Disappointing. Personally, I’m a bit of a cheat and still eat fish and seafood, so I opted for the yummy-sounding monkfish and prawn thai curry (£14.50) which didn’t disappoint. The dish was a regular melee of seafood and veggies, topped with toasted coconut flakes which gave the dish a nutty edge. The pile of veggies and juicy seafood came on a bed of noodles; I would have preferred rice (better for soaking up that creamy curry sauce!) but overall, this was a unique and delicious take on the traditional thai curry. Our table also ordered some “good fries,” which were beautifully presented in a rustic mug wrapped in greaseproof paper (£3) and the slow cooked chili beef brisket, served with corn bread, sour cream, cheese and salsa (£10). This is the only place I’ve seen in Sheffield that serves this American favourite, so if you fancy a twist on the traditional beef dish, get yourself down to the Mud Crab! One member of our party called it the best meat dish they’d ever tasted, so you won’t be disappointed. The Mud Crab puts a fresh slant on the restaurant staples of burgers, curry, sarnies and meat dishes, and we thoroughly enjoyed everything that was served (they just need to add a few veggie alternatives.) 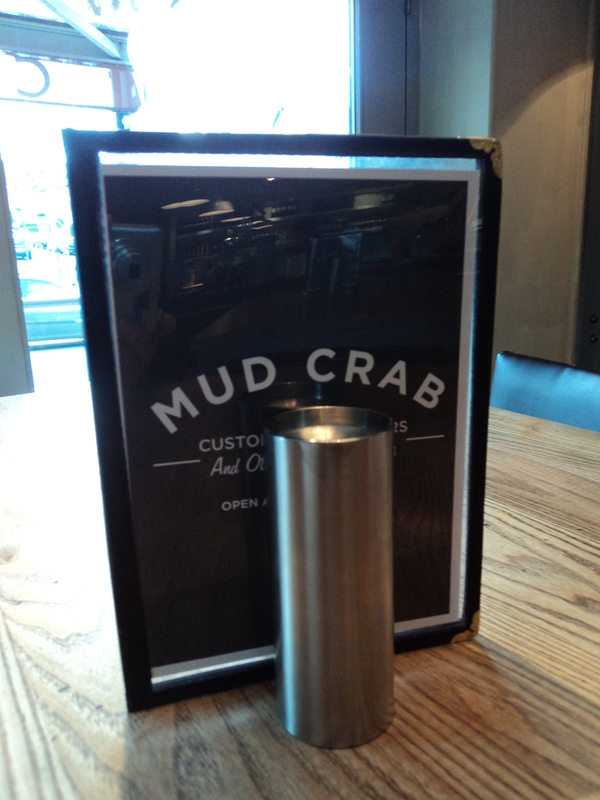 Mud Crab is also a wonderful addition to Sheffield’s ever-growing cocktail bar scene. If you’ve exhausted the menu at Browns and Revolution de Cuba, then you owe it to yourself to venture down to Mud Crab.